There's a reason the ponytail works well in the heat; it's a simple, elegant style that feels like you're not trying too hard. Editor Trudi Brewer shares her tips and tricks for nailing the perfect-looking pony. Trudi Brewer wearing Madly Sweetly Jungle Carnival dress, $239 and Gucci 0225 sunglasses, $745. Photographed on location at Waikiki beach, Hawaii. Make sure your hair has movement when wearing a tousled pony. The fastest way to create this is to wrap a few sections around a curling iron before pulling your hair back. Or go to bed with damp hair the night before, twist our hair into a knot, and in the morning you should be sporting soft natural wave, without frizz ready to pull back into a pony. Dry shampoo adds instant texture and helps create a tousled ponytail. Direct the spray at the roots, then tease the hair lightly with a brush. Pull the hair back into a medium-height ponytail a little higher than the nape at the back of the head, and secure with an elastic. Slide the elastic down slightly, and then split the pony into two sections. Pull the hair apart to retighten, which tousles the hair at the crown, and gives some flattering height. Wrap a section of hair around the base of the tail, to hide the elastic. Secure with bobby pins. To tame any frizz or fluffy ends, finish with a little hair oil or balm on the tail of the pony to add extra texture. Don't try and be too perfect with the end look, if it appears well-groomed pull out some strands to give the finished look some movement. Tangle Teezer Back-Combing Hairbrush, $20. Co Lab Dry Shampoo, $10. 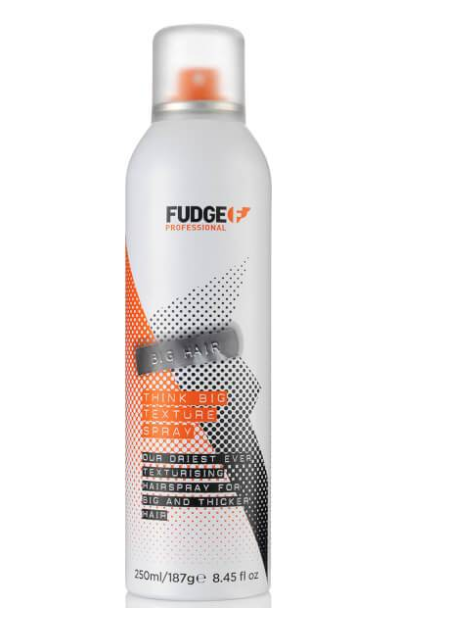 Fudge Think Big Texture Spray, $26. Redken Frizz Dismiss Smooth Force, $25.